On our terrain we have forests where our firewood is growing (for our wood stoves and heaters on wood), timber wood (false acacia, sweet chestnut, cherry, walnut, oak) and fruit & nut trees (walnut, hazelnut, mulberry, cherry, apple, plum and many others). We have several wells with fresh spring water, of which we use only 1 at the moment. Our top of the hill catches a lot of sunlight and the vegetable garden is positioned on the south facing part. The soil is black & beautiful, full of air and life, and we feed it with compost and natural fertilizer to keep it like that. The house is surrounded by forests so we're quite protected from storms. We rebuilt the "ruin" that was abandoned during the Yugoslavian war. We used mostly natural and local materials, like strawbales from a farmer in Zivkovic Kosa, kaolin clay from the mine in the forest, sand from our land, and tree trunks from our forest. Our ecological vegetable garden is a beautiful part of the terrain. No rows with more of the same vegetables, but small, usually round beds with a big variety of colorfull vegetable and herb combinations to help each other. We have fresh vegetables all year round and we grow our own seeds. We also grow a lot of edible flowers (nasturtium, borage, calendula/marigold) between the vegetables to spice up salads and atract even more bees. On a more sloping part we have built terraces to keep the nutrients in the soil. We don't dig & don't disturb the soil life, we add lots of compost and manure, we mulch heavily and use herbs and garlic as fertilizers and bug repellents. We experiment with the moon calender, with hugelbeds, keyhole gardens, terraces and companion planting. We're working on a forest garden next to the orchard, to provide us with more fruits. A forest is alow maintenance area and if you plant only fruit trees, berry shrubs, perennial and self-seeding vegetables and herbs, you only have to harvest (ideally). We'll find out how easy a forest garden is & keep you updated! Also on our project list is a natural swim pond. We already have pipes going from the house down the hill, to an open spot in the forest where we dug a pond. The pipes collect rainwater, bath water and kitchen water (not the toilet water), that will be cleaned first by sand, then by charcoal, and after that by waterplants in the pond. 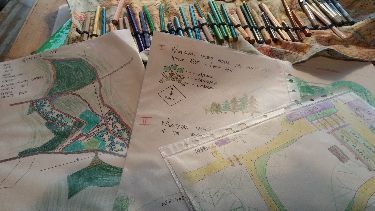 Follow Barbara's board Permaculture inspiration on Pinterest.